Tonight, we deployed a major update to RBCommons that brings with it an improved look and feel and an assortment of new features. 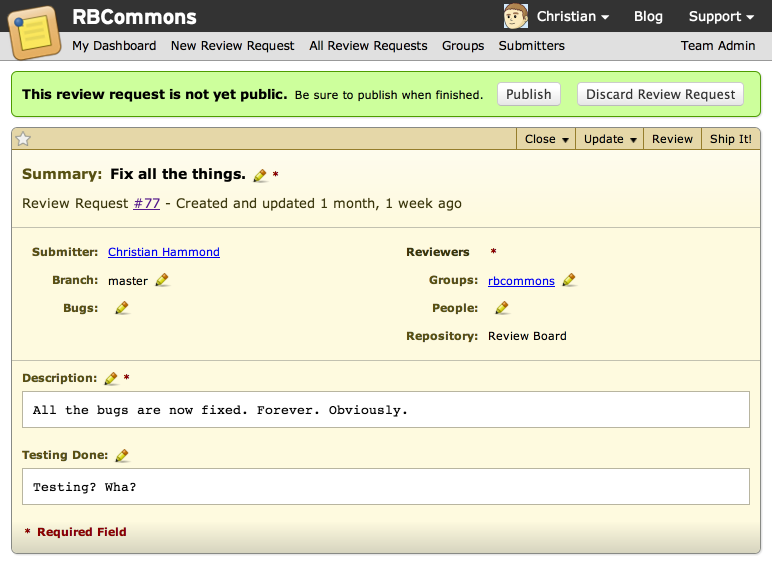 RBCommons, as you may know, is powered by Review Board. Historically, we’ve used Review Board 1.6 under the hood, but now we’re on 1.7, the latest and greatest. The first thing you should notice when you next log in is that there’s a cleaner, smoother feel to the site. Fewer sharp edges. More consistent font sizes. We’ve strived to bring more consistency and to shed a lot of our older warts. This will only get better from here on out. It can be hard to keep track of all the issues your teammates want you to fix, especially if there’s a lot of reviews. Sometimes things just get missed. That would happen to us, at least, so we decided to fix it. A summary of all opened issues is now shown right on the review request, making it easy to see how much work you have to do. You can filter the list or jump down to the relevant comments with one click. If you’re using RBCommons with Git or Perforce, we’ll now show your moved files intelligently, instead of one big delete and one big add. That means you can move a file, make some changes, post it for review, and you’ll see those changes show up. Much easier to review! We used to support uploading both screenshots and arbitrary file attachments, and you had to tell us which it was. Pretty ugly. It’s much simpler now. 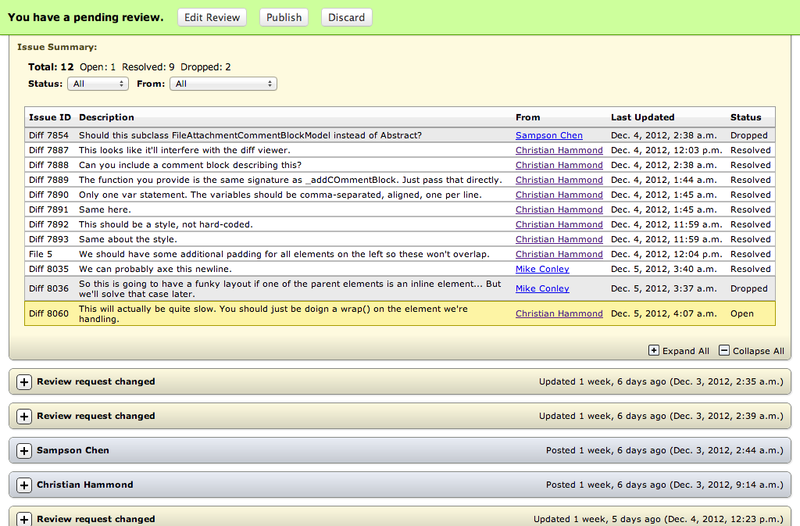 Just drag-and-drop your file onto the review request, and it’ll be attached. We’ll even show a preview of the file if we can (currently this supports images, MarkDown files, ReStructured Text files, and generic text-based files). Just like before, you can review images, just like diffs. We’re going to be adding this ability for other types of files in the future. Like it? Hate it? Have questions? 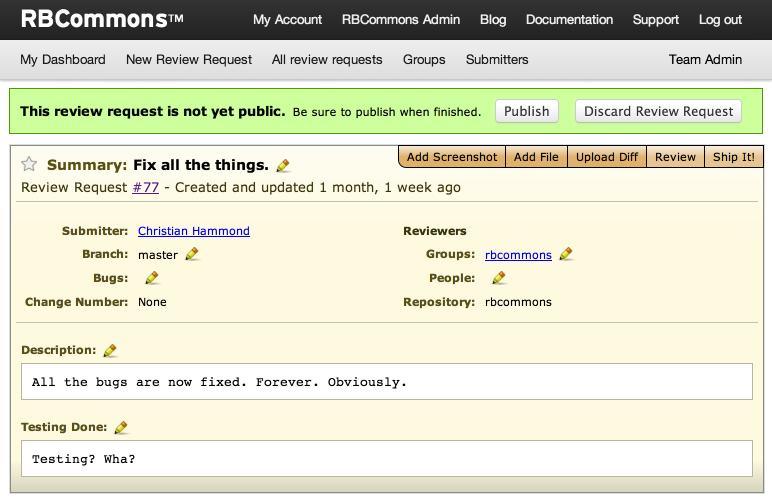 We’re going to be taking RBCommons down tonight at 11PM PST for a major upgrade. This upgrade will improve the look and feel of the site, add some new handy features, and increase performance. At the same time, we’re moving onto new, more resilient servers. This upgrade may take up to an hour. There will be an announcement when we’re back up.